Place the almonds and pecans in a food processor and process until they break down into small pieces. Add coconut and salt and pulse to combine. Add the pitted dates and rice malt syrup and process until the mixture is well combined and sticky in texture. Using the back of a wet metal spoon, press the mixture evenly into the base of a 21x21cm square tart/cake tin lined with baking paper and then place in the freezer while you make the raspberry filling. Drain the cashews and blitz them in a food processor with the rest of the filling ingredients. Continue to process until the mixture is smooth and creamy. Pour the raspberry mixture over the base and then return to the freezer to set for at least 4 hours. Add all of the sauce ingredients to a small saucepan and stir to combine. Bring to a simmer over medium heat, stirring occasionally, until slightly thickened. Remove and allow to cool slightly. Refrigerate until ready to use. Once the slice has set, remove from freezer, allow it to stand at room temperature for 2 minutes and then slice into portions. 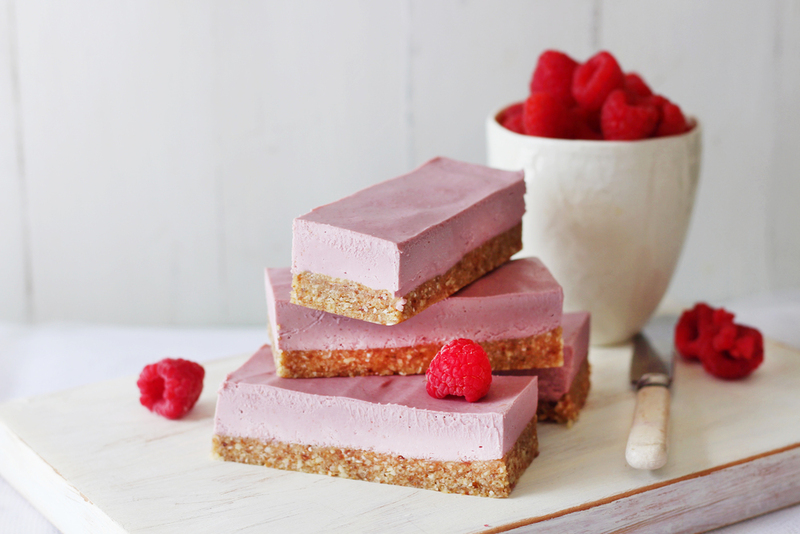 Drizzle some of the raspberry sauce on top of each slice, top with fresh raspberries and serve immediately. Keep this slice stored in a sealed container in the freezer.